With potentially seven or eight weeks of holidays ahead of them, teenagers need some decent books to keep them away from their screens! Young adult fiction can be a tricky area to navigate – a book that a nineteen-year-old might enjoy may not be suitable for a fourteen-year-old. The age of the protagonist is a good guide as teenagers usually like reading about a protagonist a year or two older than they are. However, there aren’t any rules with young adult fiction so don’t let the suggested ages hinder anyone from reading a good story. There are a couple of books here told by both a female and male protagonist, which makes it more appealing to girls and boys. While girls will usually want to read a book with a female protagonist and vice versa, it’s so important to encourage kids to read about a variety of viewpoints. Here’s a selection of ten fabulous young adult reads. 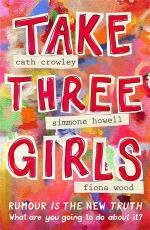 Take three girls by Cath Crowley, Simmone Howell and Fiona Wood – this book delighted me because of the concept – three Yr 10 girls at the same school who didn’t have much to do with each other are forced into a group through a school wellness program. They all branch out and develop in unexpected ways, as does their friendship. The story is told from three different viewpoints, and all three voices are strong. This book also terrified me because of the social media angle – there’s an anonymous website where students at local schools comment on different posts, like a list of girls with eating disorders and unflattering photos. This book is one for girls aged 14-16. The gathering by Isobelle Carmody – this is an oldie, published in 1993. Nathaniel has moved with his mother to a quiet suburb where everything appears to be in order but underneath the surface lies evil. Nathanial learns he is one of the Chain, a group of five kids who have been chosen to break the reign of evil by the head master, Mr Karle. This is quite a grim, page-turning tale, suitable for 13-15 year-old boys and girls. Legend by Marie Lu – I’ve just started this one, and so far, I’m intrigued. One of the protagonists is Day, a boy who is undercover because he’s wanted by the authorities but secretly watches over his family. The other protagonist is June, who has skipped ahead a few years at college, and lives with her beloved older brother. Day and June have heard of each other but don’t know each other. One day, June’s brother is killed by Day, and June swears to find Day and kill him. The hate you give by Angie Thomas – this is one of my favourite reads (children, young adult and adult fiction) for this year. It’s about Starr Carter, a sixteen-year-old African American girl living in Garden Heights, an area notorious for crime and drugs. She goes to school at Williamson, where she’s one of a handful of black students. Within the first twenty pages, she’s at a party chatting to an old friend, Khalil. There’s gunshots at the party so they flee in Khalil’s car, are pulled over by the police and because Khalil checks to see if Starr is ok, he’s shot dead. As you can predict, the novel focuses on the cruelty and unfairness of a young black man’s life at the hands of a white policeman. You can read a longer review here. Suitable for boys and girls, aged 13-16. This is Shyness by Leanne Hall – This is an apocalyptic type book, where darkness reigns over the suburb of Shyness. While many have left Shyness, those that remain live out their days without sunlight, watching out the for sugar-high Kidds. When Wildgirl, an outsider, meets Wolfboy from Shyness, they spend a night exploring the best and worst of Shyness. This story is told from both viewpoints, making it an excellent choice for boys and girls, aged 13-16. It won the Text prize in 2009. The girl from everywhere by Heidi Heilig – It’s about a sixteen-year-old girl called Nix Song, who is a Navigator on a pirate ship with the ability to follow maps into the margins, into different countries and different timelines. Led by her father the Captain, and supported by a crew of time refugees, she discovers her own abilities. She needs to, lest her father steer them into a time and place where Nix doesn’t exist. Perfect for 14-16 year-olds. No limits by Ellie Marney – I loved reading this book earlier in the year. It’s gritty but the two characters are interesting, the danger they find themselves in is page-turning and the chemistry between them is magnetic. Because the story is told from both Derwent and Amie’s viewpoints, it’s another great read for boys and girls, aged 15-18. You can read a longer review here. 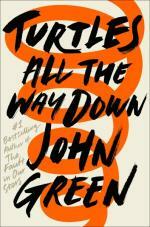 Turtles all the way down by John Green – another moving book by best-selling young adult novelist, John Green. I didn’t cry through this one, like I did with his earlier book, The fault in our stars, but it was definitely a page turner. The protagonist of this story, Aza Holmes, has anxiety. She lives with her mother, loves her best friend Daisy (who is one of the most vividly-drawn sidekick characters I’ve enjoyed) and has reconnected with an old friend, Davis, whose billionaire father is missing. Anxiety for Aza manifests itself in a fear about the bacteria Clostridium difficile. This means she has to constantly check an old wound on her finger, washing it, using hand sanitiser and reapplying fresh bandaids. It also means she worries about kissing Davis – all that bacteria. Reading Aza’s thought processes was exhausting but it put me right into her head. Like all John Green’s characters, Aza has a strong voice and her courage makes her a likeable character. The orange spiral on the front cover is a motif for the way Aza sees her thoughts, spiralling down and down into a never-ending vortex. This book is suitable for 14 years plus. Green has added a list of supportive websites at the back of his book for readers who may be affected by the issues raised in his book. Please pass this post on to anyone who may be looking for young adult books to buy as Christmas presents. I’ll be compiling a list for adult fiction within the next week or two. Happy Christmas shopping!